Note: As you can see I'm trying a new style of presentation. By keeping the pictures in spoiler tags it allows me to use more screenshots without large pictures rendering the review unreadable. Screenshots taken at varying resolutions using the High-Res patch. Would appreciate feedback on setting it out like this. Exploring The Glow with Ian. 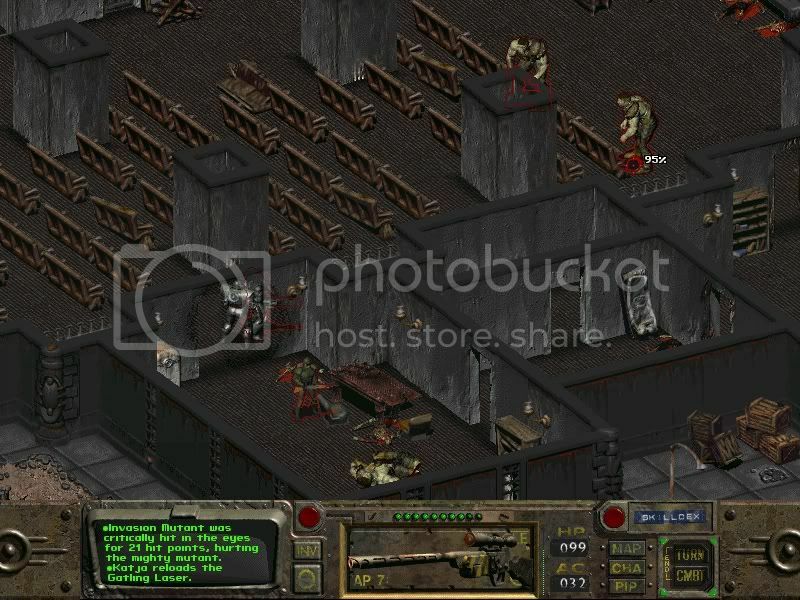 Fallout is a unique title in that many people who consider themselves fans of the Fallout series have never played it. For a long time I was one of those people. For most, the limelight remains with the two current generation titles, Fallout 3 and Fallout: New Vegas. However, to overlook the original, from a time before the series developed into the FPS hybrid it is now known of, would be a real shame. An undisputed classic of the RPG genre, it hails from the era of the isometric RPG. 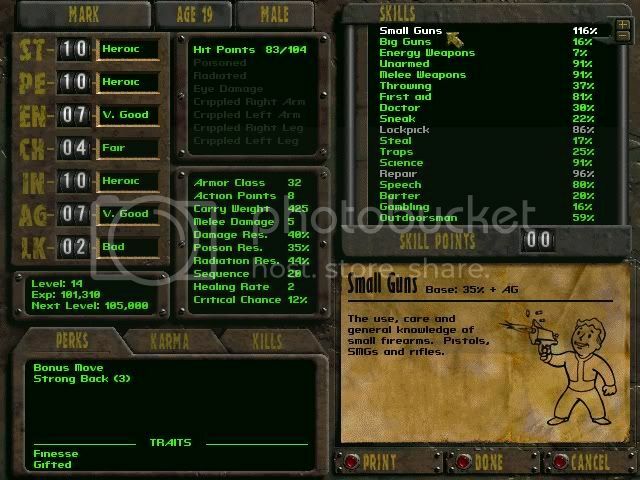 It was one of the first RPGs to offer player choice within the main storyline and an ability to tailor your character to your playstyle, beyond the standard Warrior/Wizard/Rogue setup so often seen. It was also one of the first major RPGs to depart from the traditional sword and sorcery setup, taking the setting instead to an alternate timeline post-nuclear America. Often considered the spiritual successor to â€˜Wastelandâ€™, another post-apocalyptic RPG, it was a considerably important game. 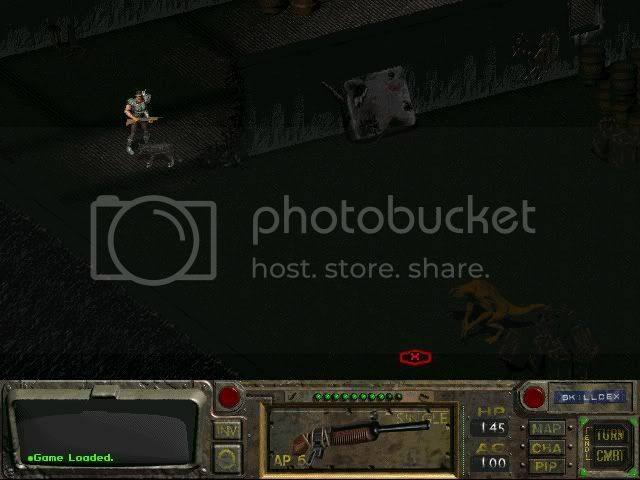 The world of Fallout is one of the gameâ€™s greater draws. The setting of Fallout takes a retro-futuristic take on the world, depicting the technology as how â€˜future technologyâ€™ was viewed in the 1950s. The music, art style and other aspects also resembles that of 1950 America. 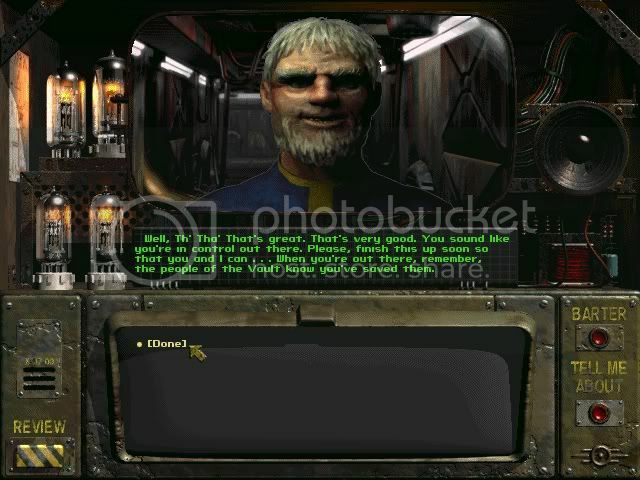 The storyline is engaging, and begins with your character, known as the Vault Dweller (Not to be confused with the Lone Wanderer of Fallout) being sent out of his home, Vault 13, by its Overseer in order to retrieve a replacement water chip. Without the water chip the Vault will be unable to produce clean water, with fatal consequences. The time sensitive nature of such a quest is reflected in-game, and if you are unable to return with a chip before the deadline expires, the game is up (The amount of time you have has been patched to allow you plenty of freedom, however). The Vault Dweller has known nothing but the shiny, safe interior of the vault for the entirety of his life. The world outside is harsh and dangerous. This is made obvious pretty quickly; the first thing the Vault Dweller discovers after exiting the Vault is that he wasnâ€™t the first choice as the Vaultâ€™s saviour, with the first choice getting only so far as a few steps. The nature of the Vault Dweller is entirely up to you, although there is a canon version. Male or female, young or old. A charismatic gunslinger, a wily thief, a disaster-stricken diplomatâ€¦ There are plenty of possibilities. 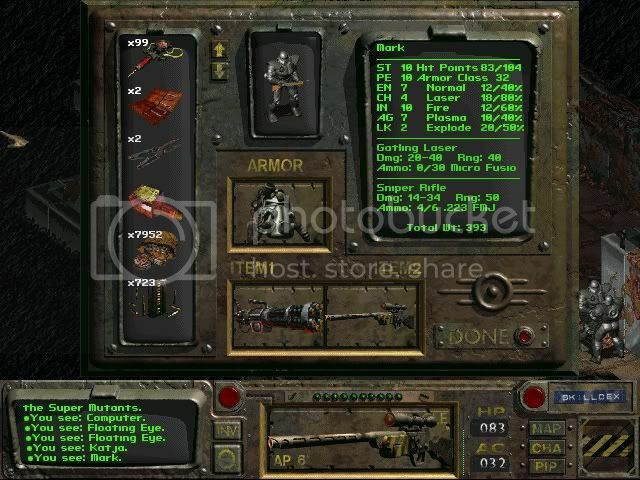 Fallout is the first game to introduce the seriesâ€™ trademark S.P.E.C.I.A.L system (Strength, Perception, Endurance, Charisma, Intelligence, Agility, Luck) and unlike with later Fallout games, proper stat allocation here is crucial to how your character will perform and interact with the world, and finding a balance is extremely important. Thereâ€™s no point in sinking points into Charisma if youâ€™re so stupid that you canâ€™t talk to people beyond grunting and snarling, and would lose a battle of wits to Harry the Super Mutant. Refreshingly, unlike other games Luck does play a noticeable role. Particularly if you have a very low score, with your own munitions liable to relieve you of your fingers. You can further customise your character by choosing â€˜traitsâ€™; permanent characteristics that give you a bonus at a price, such as being able to land devastating critical hits but dealing less damage with normal attacks. Or you could choose the â€˜Bloody Messâ€™ trait which just makes everyone die really horribly. As you level you can choose perks of varying usefulness, which for me meant that my unlucky sniper was able to carry ridiculous amounts of equipment and move further than normal while fighting. The turn based combat is solid but larger fights can become tiresome. And youâ€™re likely to see a lot of combat; many encounters can be avoided if you play it right, but unfortunately giant scorpions and feral ghouls are notoriously closed to negotiation. In the harsh world of Fallout violence is a norm, and force is often used to rule over diplomacy. The player character can deal with this as they wish, or ignore it altogether. In addition to player choice, the above example also shows that there is some technical limitation in place. Understandable, given that the game was published in 1997. AI can be rather poor in places, particularly with regards to your companions who will quite happily shoot you in the back if you happen to be in the way, and if a friendly NPC accidentally shoots one of your companions you can expect things to go wrong very quickly. Annoyingly you cannot upgrade their armour, effectively making them a liability if you want to keep them alive against the bigger and meaner foes, but this is something that you can fix with a fan-made mod. Mysteriously they can carry an infinite amount of gear too, you just have to steal it off them (consequence free) if you want to retrieve it. The town of Adytum, farming area, post-liberation. Mods are actually highly recommended, not only for bug fixes and other gameplay aspects but presentation. 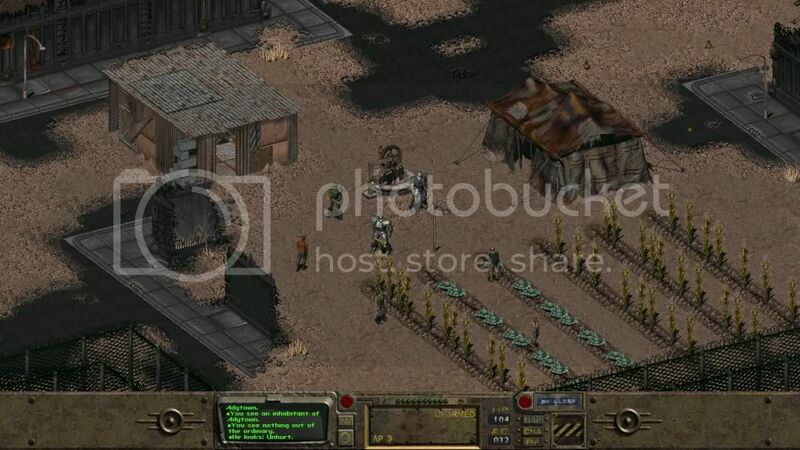 Frankly, Falloutâ€™s native 640x480 resolution graphics have fared only slightly better against time than Elvis Presley, and as such itâ€™s recommended to install the high resolution patch and make it somewhat easier on the eye. I played the game at 800x600 and it looked significantly better. It is difficult to play at its original resolution as only a very small portion of the area is immediately visible to you, and the HUD takes up a large portion of the screen too. At higher resolutions this is naturally not a problem, and makes the graphics look far more crisp too. Less resolvable is the interface, which does feel rather cumbersome. While you quickly get used to the necessity of right clicking to change from â€˜lookâ€™ to â€˜interactâ€™, aspects such of the inventory system never really feel user-friendly. Being only able to move 999 of an item at once is a particular annoyance when youâ€™re dealing with thousands of rounds of ammunition or caps (currency). The game also has some glitches that are as of yet unfixed by mods or patches; I personally encountered a curious glitch that transformed my best (unique) weapon into a Geiger counter, of all things. This is extremely rare (I couldnâ€™t find any other reports at all of it occurring), but some quests glitching so you canâ€™t finish them properly is not all that rare. 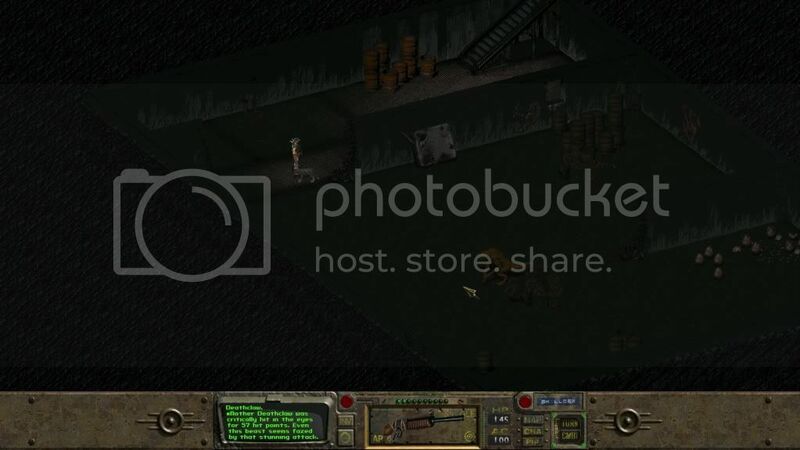 It is far more stable than the modern Fallout games, however, and it isnâ€™t really a problem. Fallout also has a great sense of humour. Filled with pop culture references and subtle gags, it always has potential to raise a smile to the wary. Most obvious is the gameâ€™s homage to Mad Max, with the iconic one-sleeved leather armour and canine companion. Monty Python references are also particularly prominent. With a great story encompassing far more than initially implied and multiple endings, each of which satisfying, it remains an RPG classic. The game is not particularly long, but nor does it feel short. However, with different ways of completing most quests in the game, and the ability to affect gameplay so radically depending on your character, it boasts a lot of replayability. A highly recommended title. In it's 'vanilla', upatched state it hasn't aged quite as well and has quite a few bugs, and I'd give it around an 8. With mods installed however it stands its ground much more readily and, while still flawed, is a compelling and classic experience that I would be pleased to give a 9. 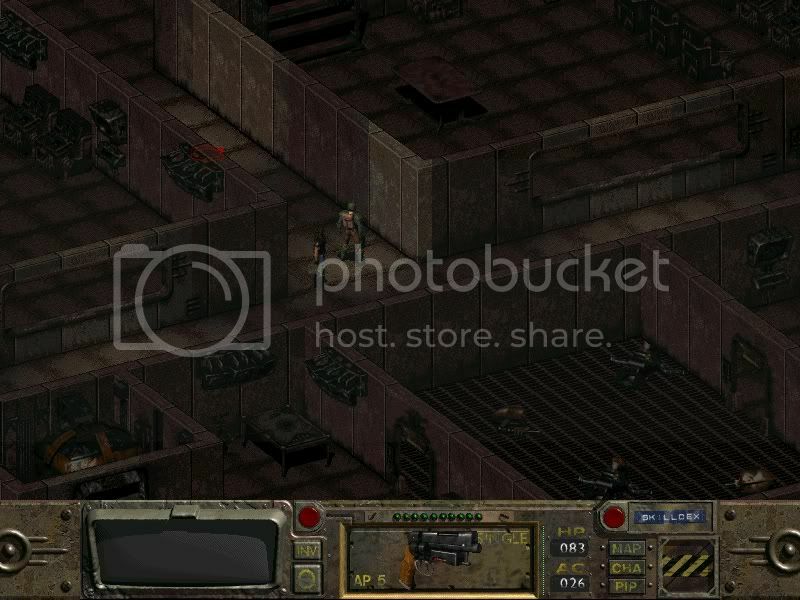 Fallout is temporarily available for free on Good Old Games, so snap it up while you can.